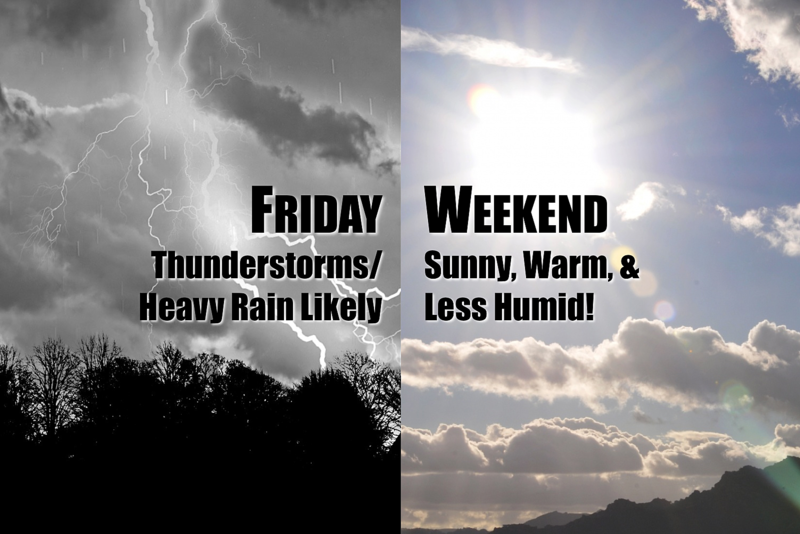 Friday's thunderstorms could produce heavy rain and flooding, gusty winds, and hail, before we enjoy lower humidity, sunshine, and warm temps for the weekend. Thursday evening brought drenching thunderstorms through New Jersey. While there were several severe warnings, I haven't seen any reports of wind damage or hail — it was just a bunch of heavy rain and lots of lightning. It looks like the Garden State will endure one or two more rounds of storms on Friday, before our weather improves significantly for the weekend. The spark for Friday's storms is an approaching cold front, that will deliver (slightly) drier air to New Jersey by Saturday. There's plenty of fuel (i.e. moisture) for these storms to become strong or severe, as our atmosphere remains very humid. So, heavy rain, gusty winds, and hail are possible (in order of threat level) from any storm that forms and pushes through the Garden State on Friday. Models suggest we'll see two rounds of storms — one Friday morning, and another from mid-afternoon through evening. Meanwhile, we'll miss the 90s today — no extreme heat warnings to worry about! In fact most of the state will get stuck in the 70s, under mostly cloudy skies. For the southern half of New Jersey (south of I-195), thermometers may spike into the 80s with a few bursts of sunshine. Keep in mind, a warmer atmosphere will yield stronger storms late Friday. Residual showers and storms will taper off Friday night, ending completely before sunrise Saturday. The previously mentioned front will drop dew points from the 70s to the 60s by Saturday morning. I still wouldn't call that "dry" or "comfortable", but our new air mass will be noticeably less oppressive than the rest of the week. As high pressure builds over New Jersey, skies should clear to sunshine by lunchtime Saturday. High temperatures will be seasonable, in the lower to mid 80s. Light winds mean the sea breeze will keep the beaches about 10 degrees cooler. Simply a beautiful day! And Sunday looks good too, albeit a few degrees warmer. I expect thermometers to climb into the mid to upper 80s to end the weekend, with sunshine and light winds continuing. Another beautiful day! Monday looks good too, even as our protective dome of high pressure departs. A few extra fair-weather clouds will build in, so I'll call it partly sunny. Highs will be right on the seasonal normals for mid-July, in the mid 80s. We might see a popup shower or thunderstorm at some point on Monday.